A cross between studio and consumer headphones, the DT 240 PRO are a worthwhile investment. Remember that kid in high school who was all elbows and knees but could still out lift you? Say hello to the Beyerdynamic DT 240 Pro. These cans look like on-ears but fit like circumaural ones. Dressed in all black, the headphones keep a low profile. A combination of metal and plastic keeps the headphones light and comfortable, even with eye wear. So much for the little black dress. We’re here to discuss the little black headphone. The Beyerdynamic DT 240 Pro look like on-ears but fit like over-ears. Unboxing the Beyerdynamic DT 240 Pro is like opening a door. Straight forward. Mundane. No-fuss, no-muss means that the listener can immediately enjoy the music. Few accessories are included. The headphones include a 1.25-meter straight-coiled cable that terminates at 3.5mm and 2.5mm, a ¼ inch adapter, and svelte cloth carrying pouch. The DT 240 Pro are compact. But the padding extends beyond what’s expected. This creates a roomier fit for those with average lobes. Additionally, each ear cup is outfitted with a leatherette ear pad and a 2.5mm audio input. Though the 2.5mm size is inconvenient, at least it’s replaceable. Plus, the ear pads look and feel more natural than alternative synthetic materials. They also fold flat for storage, preserving precious real-estate in one’s bag. Metal sliders reinforce the comfortable headband. Naturally, excellent build quality is to be expected from a company with nearly 94 years of audio experience. The metal headband and aluminum yokes elevate durability above the competition. (See the Audio-Technica ATH-M line.) Tactile, isolated clicks notify the user of how many notches the headband has been adjusted. Its architecture is so finely tuned that extended listening doesn’t pose a problem. Want more craftsmanship? Confidence-inspiring stress relievers are housed on each end of the cable. As aforementioned, the removable 3.5mm to 2.5mm cable is an odd choice. Its manageable form factor makes moving around while tethered a breeze. If 1.25 meters isn’t enough, it stretches up to three meters. A locking mechanism for the cable would have been a nice detail. However, the physical connection is strong enough that random ejection shouldn’t occur. Cable sizing is proportional to the headset, which prevents a feeling of unwieldiness. The proprietary cable is thoroughly reinforced and is unlikely to snap at either end. Warning: The DT 240 Pro have a knack for getting caught on things. The cable then catapults back towards the listener, potentially running a b-line to the face. 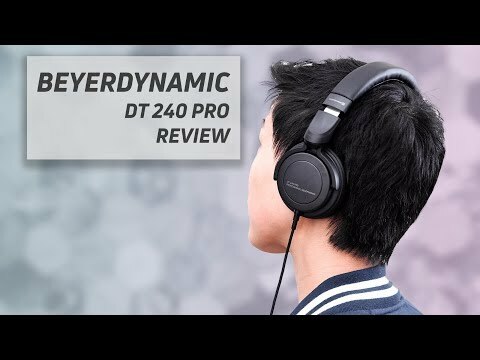 How do the Beyerdynamic DT 240 Pro sound? The Beyerdynamic DT 240 Pro are a great option for consumers looking to get a flat-leaning response out of their headphones. Generally speaking, the overall sound leaves an impeccable impression on the listener. Those graduating from cheap-o IEMs to the DT 240 Pro will feel the difference. Everything is well-produced and clear . . . until you compare them to the Audio-Technica ATH M-40x. Though this isn’t a comparison review, the M-40X are significantly clearer than the DT 240 Pro. Additionally, the A-T soundstage recreates a more realistic, all-encompassing sound. Now. Back to the DT 240 Pro. Emphasized lows make these great for commuting and daily use. Though a bump and thump is appreciated by many listeners, Beyerdynamic asserts that these thrive in both a studio and casual environment. Two weeks of testing suggest that these are skewed to the consumer ear. Though for audio equipment in the $100 sub-range, the DT 240 Pro have an exceptionally flat response. Portugal. the Man’s song “Noise Pollution” experiences an effective reproduction of low frequencies. Slight exaggeration of the lows replicates the song’s disorienting feeling. Responsiveness is swift. And the bass lingers in the mind as a result of the thump. The Beyerdynamic DT 240 Pro cable (right) has a significantly smaller footprint than the Audio-Technica ATH-M40x cable (left). The mids recreate Gourley’s eerie and forward vocals. All the while Mary Winstead’s harmonies remain clear without forsaking detail. Prior to listening for the midrange frequencies, I was worried that the mids may be overpowered by the lows. This thought was, thankfully, disproved. Winstead’s solo in the latter third of “Noise Pollution” maintains its air of dangerous seduction, a positive consequence of tonal depth. A fine counterweight to the bass, the treble steers itself through synthesized highs with fluidity. They successfully avoid the trap of over kneading the highs that lower quality products fall prey to. There are plenty of synth-created sound bites in “Noise Pollution,” none of which come off as grating, fatiguing or shrill. That said, highs roll off dully on occasion (as in many a Christmas jingle). Overall, there’s an excellent balance to be heard with the DT 240 Pro. Should you buy the DT 240 Pro? Spacious ear cups facilitate painless listening sessions. But if you’re looking for studio cans in the $100 range, the ATH-M40x are still the better option for their clarity, soundstage and flat-leaning response. There are also plenty of other similarly priced options available. However, the DT 240 shouldn’t be overlooked. They serve as an exceptional hybrid and are suitable for both casual listening and editing. A Clean Deep Bass, A Vivid Midrange And A Defined Treble Are Part Of The Trusted Beyerdynamic Sound Signature That Each Dt 240 Pro Comes With. Precise And Powerful Drivers Ensure A High Output Volume On All Devices Such As Laptops, Cameras And Studio Interfaces. The Dt 240 Pro Is Made For Producers, Podcasters And Filmmakers Who Want To Take Full Advantage Of Their Equipment's Potential. Superior Isolation From Background Noise And Minimal Sound Leakage Make The Dt 240 Pro The Ideal Tool For Mobile Use And Monitoring Applications In Crowded Places. Eliminate Distractions And Don't Distract Others!